Well, today it finally happened. After all the preparation, it was time to try my hand at the application stage. 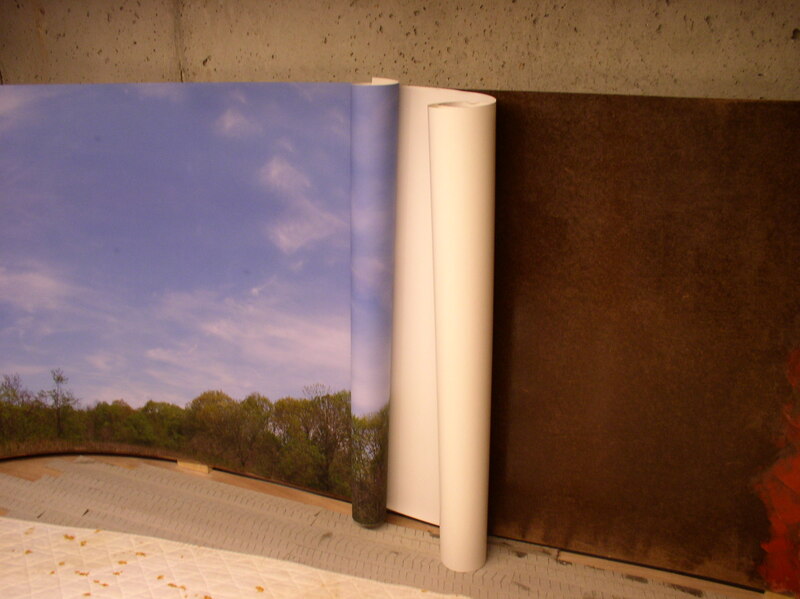 The photographic image in this case is 8 feet long in total and has been printed in three piece to make things easier to manage. There are several steps in the process and are essentially simultaneous. First, the section is unrolled and hung with clothespins to get a look at everything. The material is layered. The vinyl is what the image is printed on. On the backside the vinyl is coated with a self-adhesive compound, then it is covered with release paper to protect the adhesive. 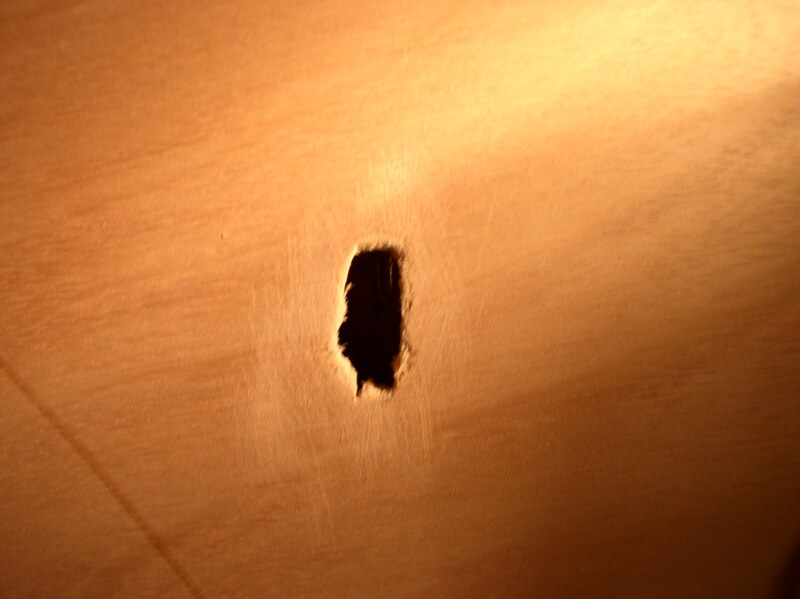 Starting with the left end, about 4 Inches of adhesive is exposed by peeling back the release paper. Once things look right and level, a soft roller is begun to be passed over the image to adhere it. This is a very careful step for a number of reasons. The main thing we are trying to assure is that the image will eventually roll out level. I use a 4″ foam paint roller which provides enough pressure to adhere the vinyl with out scratching it. The release paper is stiff enough that it can be coaxed into re-rolling itself as it is peeled away from the adhesive backing. The work here is slow and careful. I must take care not to form bubbles as I roll. Once that first foot or so is achieved, the process is pretty straight forward. Once the entire image of the first section is down, then it is time to add the next length. The match line is about 2″ before the end of the first section. The next section must have its left end trimmed and then it can be laid on top of the first section and the process begins again. I have done a photographic backdrop before, but that one had no adhesive, so I had to paste it like wallpaper. I find this new process much easier and neater, and I am very pleased with the results thus far. Where I sit with my coffee and contemplate my railroad from across the room, I am very satisfied with my progress and eventual goals. 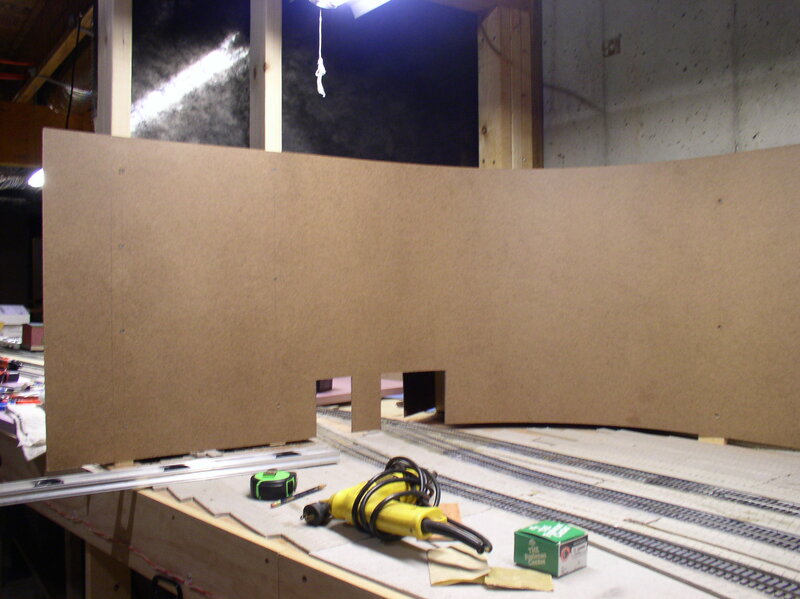 I have several friends who are constructing basement size layouts. In some ways I would love to be doing that again, but at my advanced age I know I have chosen what is best for me, a modest rendition of a minor branch line in downeast Maine. One of the reasons that I so enjoy what I am doing is that I have reasonable expectations of completion. Step One for me was to not purchase a basement when we moved south. Instead, I’m borrowing a modest portion of my daughter’s basement for a few years. That also helps to keep the project in perspective. I always chuckle when I listen to current railroad hobbyists complain about what is not available to their liking. They should have lived in through the late 40’s to early 60’s when there was literally nothing compared to today’s offerings. What we need today is a few more Malcolm Byrd’s who can select a pile of styrene and turn it into something they want instead of griping. Even a small project like mine requires sometimes years of research, the collection of equipment and materials that are appropriate, and the discarding of items no longer needed. Am I enjoying myself? You bet, because what I am doing is achievable and worth the effort. I only gather what is necessary and ignore the latest temptations without angst. Such is the discipline of prototype modeling. This is truly a wonderful hobby when one has the right perspective. A few more details have been added about the ongoing support work concerning the use of Masonite sheets. These shots were taken several days ago but a computer glitch prevented any down load to the blog until now. 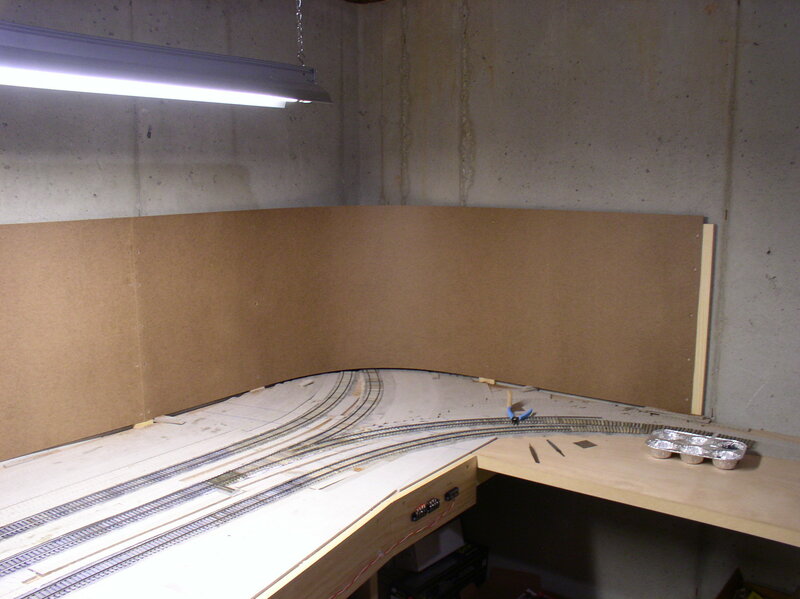 The first image shows the start of backing being added to the Ayers Junction area. Hopefully those openings at the bottom of the sheet will be hidden by a grove of evergreen trees and won’t show unless the photo is taken directly at the openings. With my limited space the backdrop here will force the transition between Calais and Ayers. 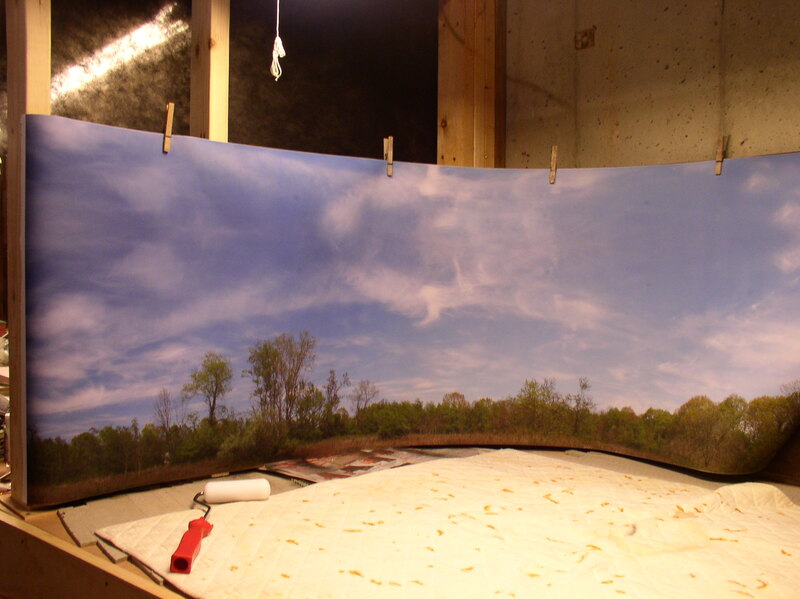 The backdrop itself is a photographic image of fields and forest which is what one would see in real life. 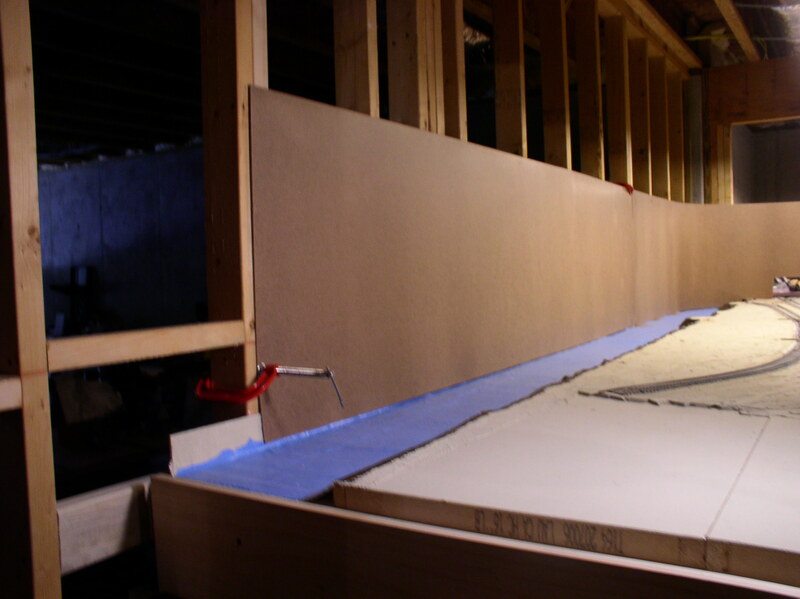 This next image shows the Masonite screw mounted to the furring strips that are mounted on the concrete wall. 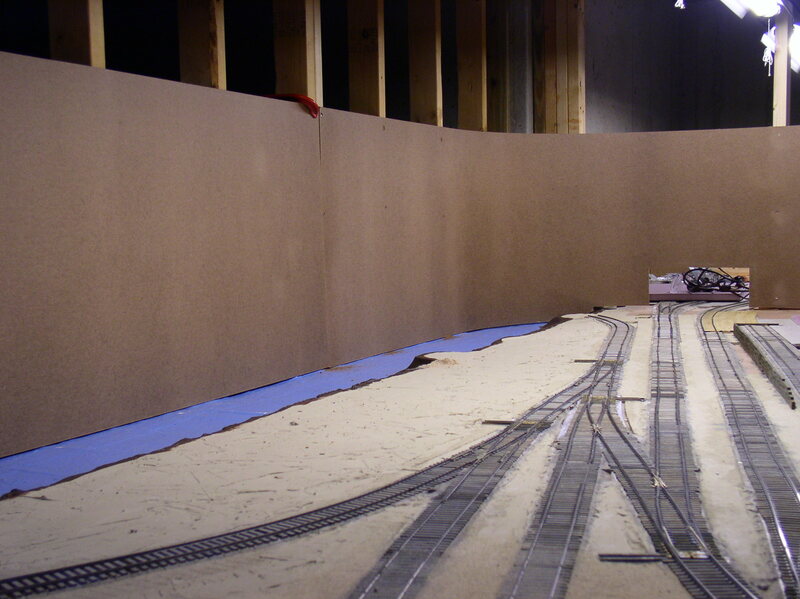 Eventually the backdrop will continue to the right and round the next corner to complete the scene. This final shot is back in Calais and shows a bit of the putty work prior to the overall epoxy coating. This putty is a mixture of the epoxy resin and some filler powder which thickens it so that it won’t sag. 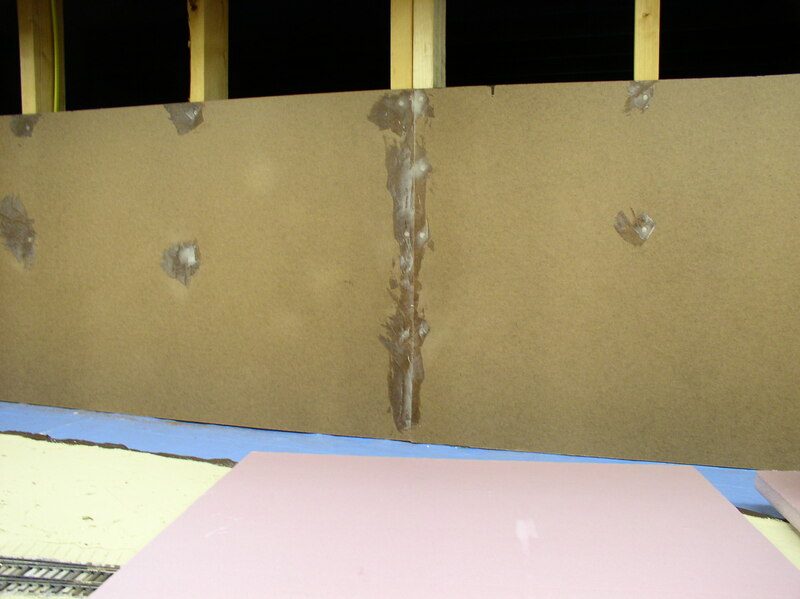 The Masonite sheeting in this photo already has been coated on the back side to render it waterproof. This all looks rather boring but necessary to avoid problems later on. 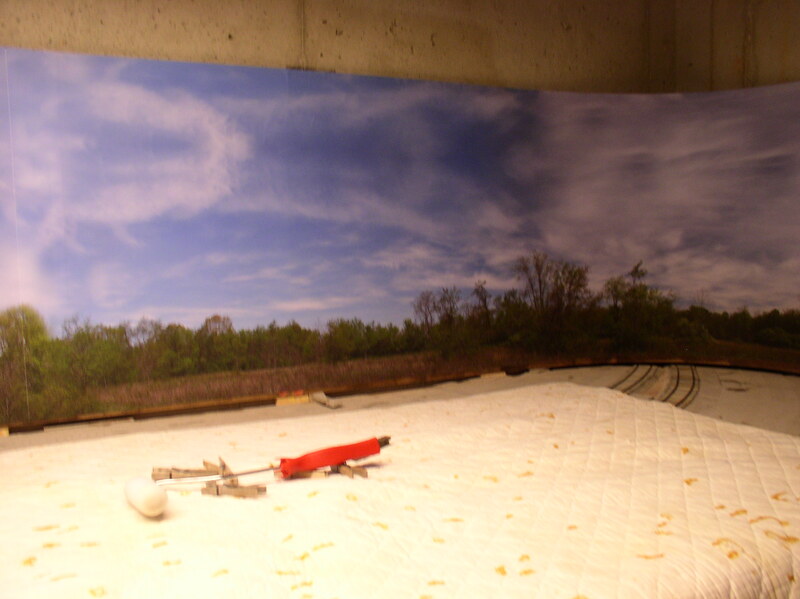 Today I hung some of the Masonite sheets that will be the backing for the photographic image that I have of St. Stephen, New Brunswick which is across the St. Croix River from Calais. This is a test hanging to check everything out. Once all is secured and plumbed the permanent screws will be added. The entire Masonite, both front and back with be coated with epoxy resin to make it waterproof before the adhesive backed vinyl is applied. 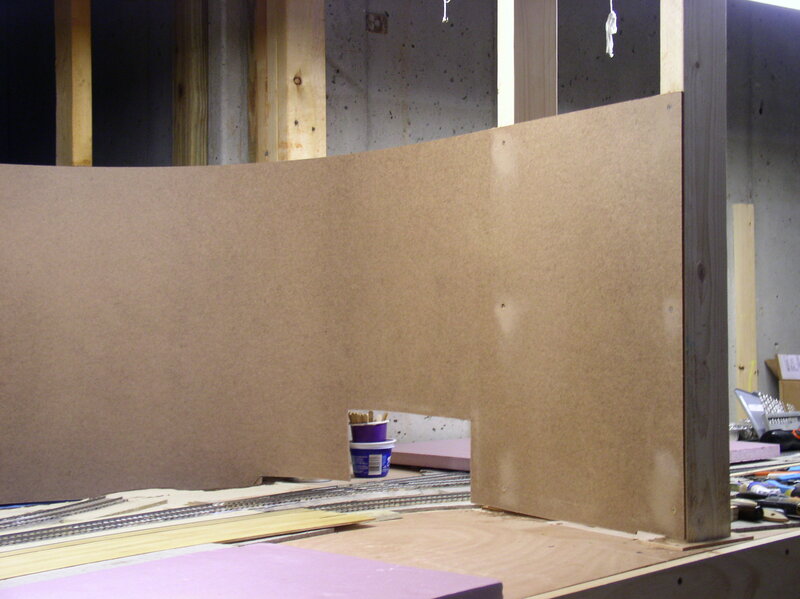 Even though the Masonite is bare, it is a nice break from looking at the row of studs behind it. Above the Masonite where the studs still show, I am going to try hanging some black landscaping fabric similar to what Trevor Marshall did with his Port Rowan line. 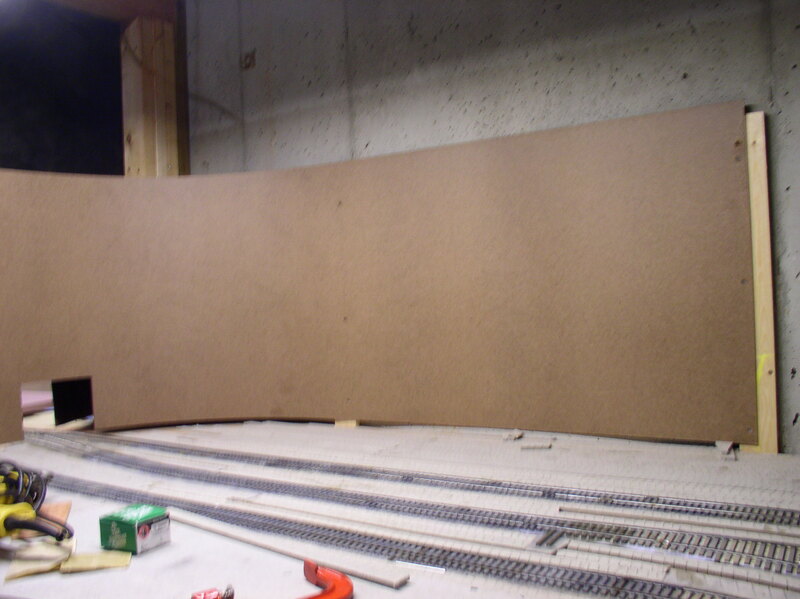 One of my HO friends also used it as a skirting around his railroad. I think it will work well for my own purposes. 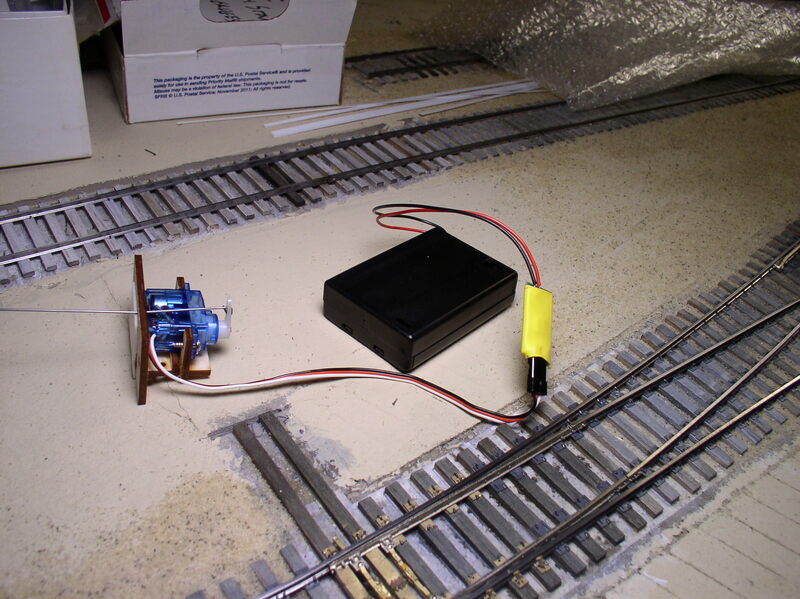 Using model aircraft servos to throw O Scale switches has intrigued me ever since I saw the idea presented in O Scale Trains magazine. The interest developed to the point where I decided I would use them on my now under construction MEC Eastport Branch. Servos are quite different from the motorized switch machines I had been used to. Instead of two wire control via DC, servos use 3-wire control and that means special control electronics. I found that Tam Valley has a broad line of servos, special RR type controls and much in the way of accessories to make the job easier. My switches reached the stage where they were built and slots cut between the headblock ties for the throw wire. So, today I decided to install a few servos. The control circuits had been mounted on the front fascia and were ready. The first photo shows the prepared servo mounted on a bracket. The bracket is supplied by Tam Valley. The servo is screw mounted to the bracket. 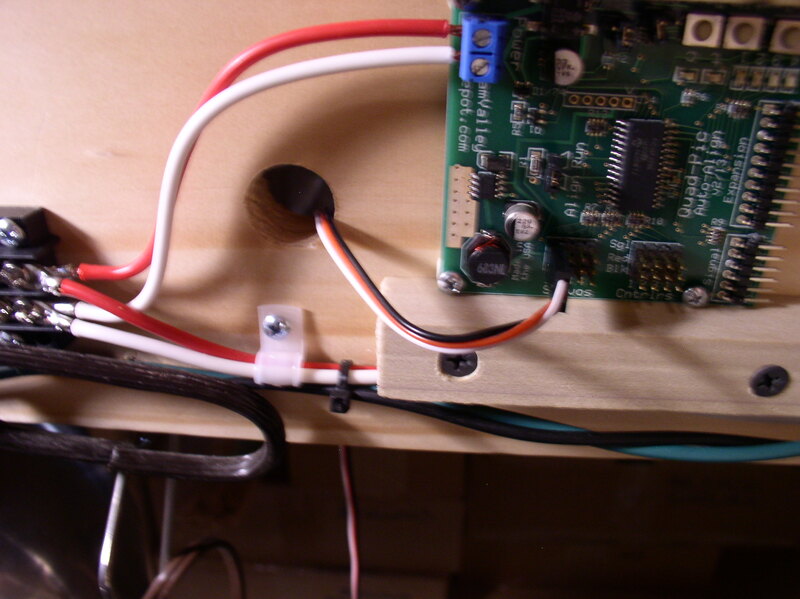 Note that it is pre-wired with about a 9″ cable and the stiff throw wire has been installed on the servo control arm. The arm shows the type I chose to work with, but the servos comes with several other versions. The pivot hole is wood which I think is more than adequate considering the number of times I expect the switch to be operated. If one is anxious about that, a small bushing is supplied that can be used. The first mounting step is to “center” the servo motion. This done by plugging the servo cable into a battery powered centering circuit (also supplied by Tam Valley) Turn ON the circuit and you will see the servo find the center of its motion. The next step is to add a two sided adhesive foam pad to the surface of the bracket that will be facing the bottom of your track support. The adhesive pad can be seen in the first photo. In my case I am using hollow core doors, so the underside of the door is quite smooth. Leave the throw wire long to make it easy to roughly find the center of the slot. If you can see the switch throw bar, then thread the wire through the hole in that and press the bracket to the underside of your track base to adhere it. If you cannot see and reach at the same time, then remove the points and throw bars from the switch and just aim the throw wire to the middle of the slot. This is not critical because the servo can be programmed later to adjust its range of throw. 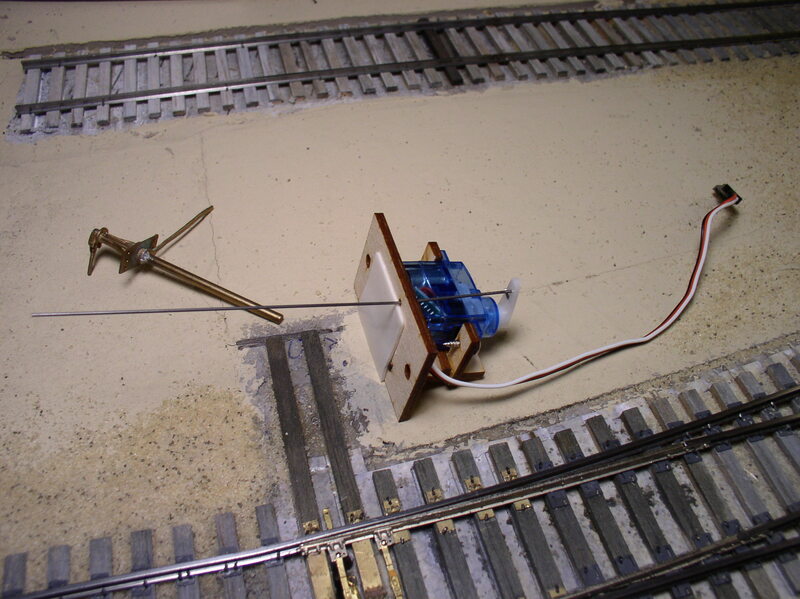 If you are able to get the wire into the throw bar then you can test moving the points by gently moving the servo arm back and forth. If all is well, then add the two screws to firmly mount the bracket. Once the bracket has been mounted, you can trim the throw wire to length. 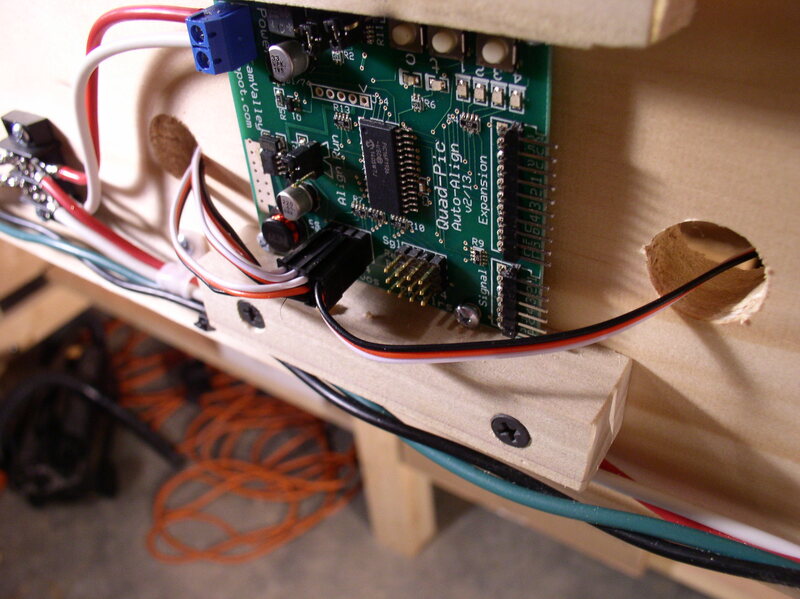 Once the servo is in place, you will probably need to add an extension cable to reach wherever the control circuit is mounted. Tam Valley sells 12″ and 40″ lengths. If you need to build your own, cords, wire, plugs, and sockets are available at your local model aircraft hobby store. 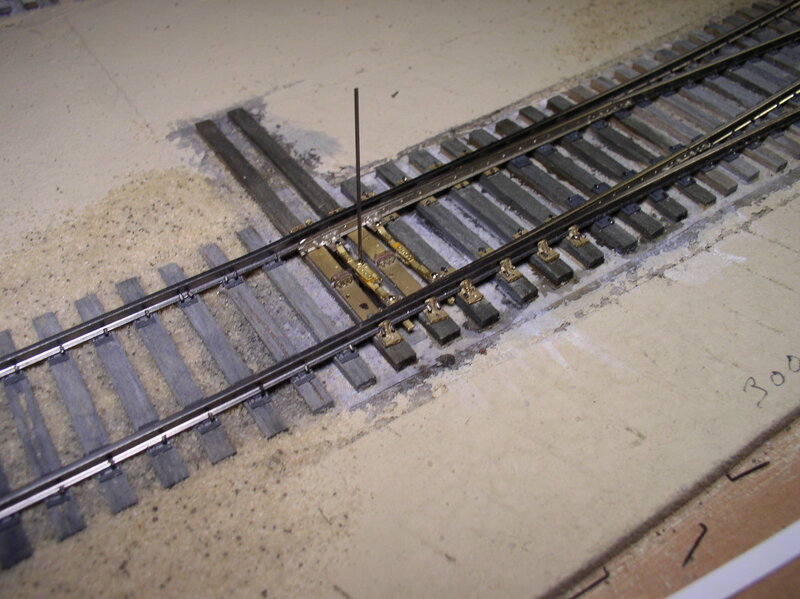 The cables were then lengthened to fit and fed through the large holes next to the control circuit. One photo shows just the first cable in place and the next photo shows the board fully loaded with four cables. Programming will come later when I get my DCC accessory buss up and running. (red and white wires into the blue plug) DCC is not necessary, as DC can also be used with small button panels that plug into the board adjacent to the servo cables. I had carefully made the slots between the headblock ties to accommodate the throw wire, but underneath I enlarged to slots to give plenty of room when installing the servo bracket. It looks pretty crude, but it works. So far I’m pleasantly surprised by the ease of installation. Compared to helping a friend install Blue Points from underneath, this was a piece of cake! I should mention that servos are available with micro switches for frog power, but I have chosen to use Tam Valley’s Frog Juicers which change frog power as necessary automatically.